Mark Slouka has written seven books, and they have been translated into 16 languages, making him an internationally known, critically acclaimed author. 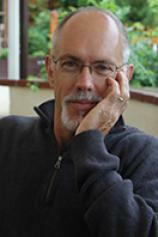 The son of Czech immigrants, he has taught literature and writing at Harvard, Columbia and the University of Chicago. 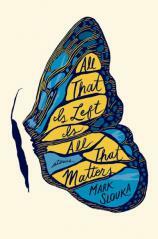 In ALL THAT IS LEFT IS ALL THAT MATTERS, a collection of 15 stories, Slouka paints eloquent portraits of average, everyday people as they grapple with life and its victories and triumphs. They fight not to be swept away by love, loss, death and circumstances beyond their control. The characters in these stories live all over the world in places ranging from the author’s native Czechoslovakia to California. We don’t get to see them in long sequences; rather, we catch glimpses of them as they struggle with the immediate events of heartbreak and life-changing moments. It's a brief snapshot. "This is serious literature with well-planned plots that are enriched with symbolism. It is meant to be contemplated and studied, preferably on a quiet rainy evening with a warm beverage." In “The Hare’s Mask,” a young son tries to protect his Holocaust survivor father from disturbing memories of killing rabbits to survive the food rationing. So he hides a hare mask under his pillow for days. One day, his father discovers him crying over it. The significance of the fact that it’s days before the boy’s ninth birthday, the same age the father was when he lost his family, is clear to them both. In “Conception”, a young couple fighting the death of their marriage gets an unexpected lift from an encounter with a fallen, naked neighbor. And in “Then,” former lovers bump into each other after 40 years. They are both old now, and she asks him to think of her as she was then. The title sums it up effectively: all that is left is all that matters. Because that’s all we have to hold on to for whatever life we have left. But some of these moments are heavy, and you watch people grieve, travel back in time, and learn about the untruths they tell themselves to simply cope with their present and to justify the choices they have made. The stories are poignant and well-crafted, but not upbeat or uplifting. They reiterate that life is short, and death is just a few paces away. This is serious literature with well-planned plots that are enriched with symbolism. It is meant to be contemplated and studied, preferably on a quiet, rainy evening with a warm beverage.